Beckham out. Thus passes a generation of English players who came to prominence at the very end of my twenties. This is how the story ends, then: that group have indeed passed on without winning an international trophy. What Gary Neville feared, and perhaps expected, has come true. Truth to tell, England’s teams since 1998 have always fallen well short. First France, then Spain, have produced better squads and performances. Holland have also just lost a generation – one which began with the astonishing Ajax European Cup winners of 1995 – but one that always seemed more likely than England’s to succeed. Moreover, the best players of the 1998-2010 era have always been prone to injuries. 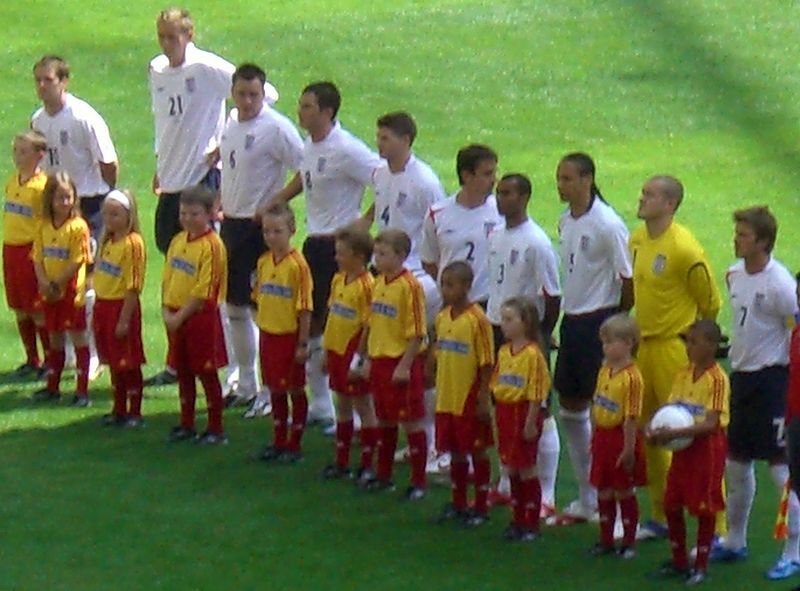 Owen and Beckham were doubtful for both 2002 and 2006 World Cups, and weren’t fully fit at either. But for 1998 and the era of AOL, Freeserve and BoL, we’d never have seen either man playing at full tilt at the top level. So much for a golden generation: England’s 1998 team, were, after all, the best of modern times. What would you give to have even an ageing Shearer now? But these are the thoughts of someone for whom Owen, Beckham and co. were the last players to arrive when they themselves could still conceivably play. For anyone now in their late 20s, the attachment to Owen and Beckham might not be there. Instead, each injury to the Old Guard brings Milner, Huddlestone, Lennon and now Adam Johnson closer to their destiny. And there’s little doubt that Capello, for all his regret at losing players through injury, is capable of picking and organizing replacements. Only Wayne Rooney, of the 23-man squad, lacks an equivalent, although there are other capable goalscorers. Unlike in 2002, the injuries to Beckham and Owen make little difference to England’s chances. Beckham’s dead ball skills would have made him a useful substitute, but it is more than time that someone made the right wing their own and remade it in their own style. It might not be over for either Beckham or Owen. Owen will play for another couple of years, and although at present it would take some real slapstick on the injuries front to knock over everyone who stands between him and the squad, it can’t be ruled out altogether. And Beckham was supposed to be gone after 2006. The man’s ability to dig himself out of the grave faster than his critics’ spades can bury him is a source of lasting entertainment and amusement. But across the rest of the established squad, there are injuries, losses of form, ennui, niggles, an accumulating depression. Under any other manager, this would be worrying. It would prompt reflections that perhaps the time to rebuild the team is now: to use the World Cup to rebuild around the Huddlestones and Johnstones. But Capello doesn’t work like that or think like that. So while Capello gets on with the job of seamlessly closing the gaps opened by injuries and turning James Milner into a kind of calm Paul Gascoigne, let’ s reflect on how Owen and Beckham will be remembered. Not, I dare say, like Shearer and Adams are remembered. At his peak, Shearer gave England the sort of security you feel when you’ve been trapped by freak weather in a millionaire’s pantry: that feeling of infinite backup. Both he and Tony Adams had a football fan’s sense of priorities (which Shearer comically rehearsed all over again in this Smalltalk interview). I approve of footballers having hinterland – Owen’s racing, Beckham’s… skiing. But I know that most fans would rather their heroes be as obsessed as they are. There’s some chance that Beckham will morph into something Charltonesque: he’s already to some extent a go-to-guy when it comes to competing for Olympics and World Cups. He’s good at being an ambassador, and if English football needs anything, it needs a sunny exterior to show the world. Beckham will not be wasted as Bobby Moore was wasted. Owen’s own future is already well mapped out. A bit more football, then training racehorses. He’ll pop up on television now and again as a contemporary, relevant figure in a different sport, one which some suspect he prefers. His relatively closed personality will leave him with an enigmatic air around him: a man who appeared very suddenly, scored 40 goals for his country, and then went away again little older than George Best.